Bali is an island and province of Indonesia. The province includes the island of Bali and a few smaller neighbouring islands, notably Nusa Penida, Nusa Lembongan, and Nusa Ceningan. It is located at the westernmost end of the Lesser Sunda Islands, between Java to the west and Lombok to the east. Its capital, Denpasar, is located in the southern part of the island. With a population of 3,890,757 in the 2010 census, and 4,225,000 as of January 2014, the island is home to most of Indonesia's Hindu minority. 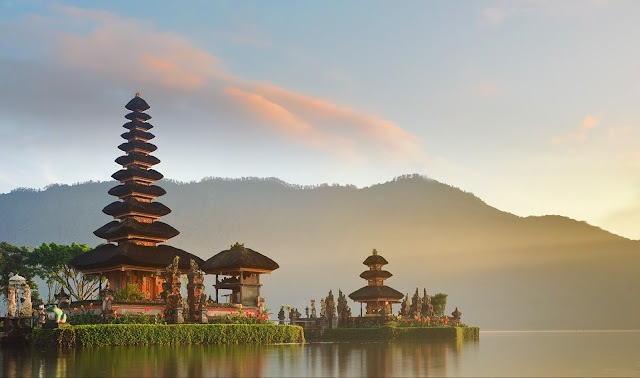 According to the 2010 Census, 83.5% of Bali's population adhered to Balinese Hinduism, followed by 13.4% Muslim, Christianity at 2.5%, and Buddhism 0.5%. Bali is a popular tourist destination, which has seen a significant rise in tourists since the 1980s. Tourism-related business makes up 80% of its economy. It is renowned for its highly developed arts, including traditional and modern dance, sculpture, painting, leather, metalworking, and music. The Indonesian International Film Festival is held every year in Bali. In March 2017, TripAdvisor named the island the world's top destination in its Traveler's choice award. Bali is part of the Coral Triangle, the area with the highest biodiversity of marine species. In this area alone over 500 reef building coral species can be found. For comparison, this is about 7 times as many as in the entire Caribbean. Bali is also home to a unified confederation of kingdoms, composed of 10 traditional royal Balinese houses, where each house rules a specific geographic area. the confederation is the successor of the Bali Kingdom. The royal houses are not recognized by the government of Indonesia, however, they have been operational since their establishment prior to Dutch colonization. Pura Ulun Danu Beratan, or Pura Bratan, is a major Shaivite water temple on Bali. The temple complex is located on the shores of Lake Bratan in the mountains near Bedugul. Water temples serve the entire region in the outflow area; downstream there are many smaller water temples that are specific to each irrigation association (subak). Built in 1633, this temple is used for offerings ceremony to the Balinese water, lake and river goddess Dewi Danu, due to the importance of Lake Bratan as a main source of irrigation in central Bali. The 11-storey pelinggih meru in the complex is dedicated to Shiva and his consort Parvathi. Buddha's statue is also enshrined in this temple.Lake Bratan is known as the Lake of Holy Mountain due to the fertility of this area. Located 1200 m above sea level, it has a cold tropical climate. The photo scene is lovely. I have only been to Bali for one day and would like to go and explore more places like this. Beautiful - this looks so exotic and peaceful. Such a lovely view ! !